Hey guys, me again with another question and hopefully get some help. So i notice from the last 2 weeks my cherries are dying one after another, as if a ritiual where one dies each day. I tested the water and PH Level is fine. Unfortunately I dont have a master test kit. So all I can test for is Ph. Once I noticed that my shrimps are dying one after another I did a 20% water change and the next week a 50% with Prime added to the new water. Yet they still seem to die one by one.. This is some more critters i found in my RCS tank. 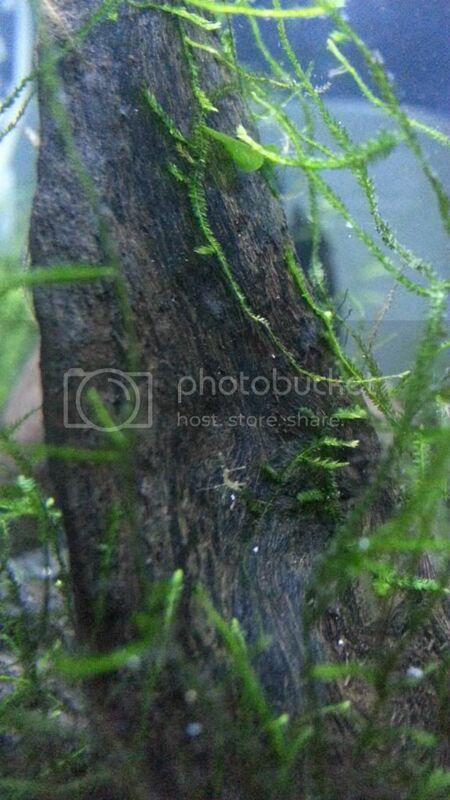 I dont know what they are but there is like 10-12 of them in amongst my java moss. Here is another photo them. If someone can tell me what these Critters are would really help. I have caught them all(I think) and they are in my breeder box ready to be eradicated! 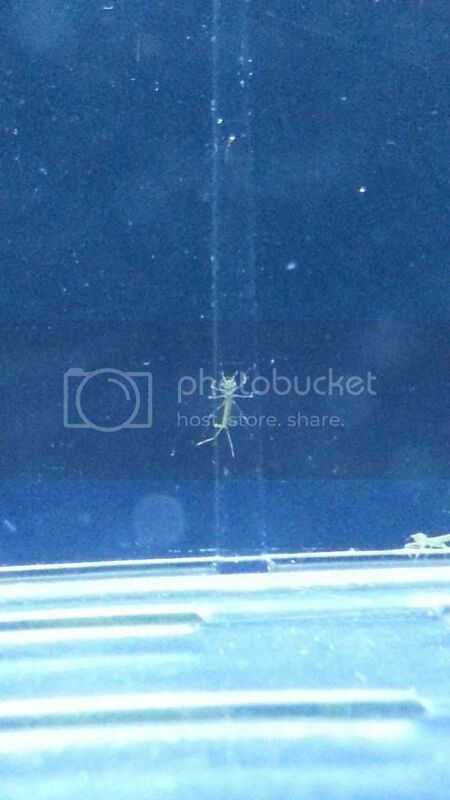 Also could these Critters be the culprits that are causing my shrimps to die one by one? Similar critters include Dragonfly and Damselfly larvae, of which it is hard to tell the difference. Dragon fly larvae have internal gills in a short body, mayflies have three gills on the end of a long tail. These are all pics damselfly nymphs (not mayflys). Why is this an article? We make things an article so that the information is readily accessible. It goes without saying that DiscusEden has spent hundreds of hours writing these articles, and with the amount of things she has covered and the amount she still has to go, sometimes it is easier to just copy the things that have been said in the forum and edit/format/bulk them up them later. It is especially helpful when someone has already started a discussion on them and someone with knowledge in the area has commented on it. Later on it is possible that it will be formatted correctly and have more information added to it. I think DE published this particular one, and whilst it may not be entirely accurate, it's easy if someone says 'omg what is this thing, it is killing my shrimp' to refer to them to the article, where they can find pictures to compare and the threads to see where this has already been discussed and clarified. I'm clearly not an expert on Dragonfly/mayfly/caddisfly/damselfly larvae, i can't comment as to whether it is accurate or not. If you feel it is not, you are more than welcome to write up a better article, i'll publish it here for you and give you full credit. Save's DE from doing all the work herself, considering she has written at least 60 articles from scratch, i think she is doing a wonderful job. Clearly in terms of this, i have no idea what is what, but given my limited knowledge, i believe that all of the above are predatory right? Perhaps this article would be better served labelled as 'predatory insect larvae'. I'll get back to this one later, when i have some free time, unless someone else wants to do it for me? 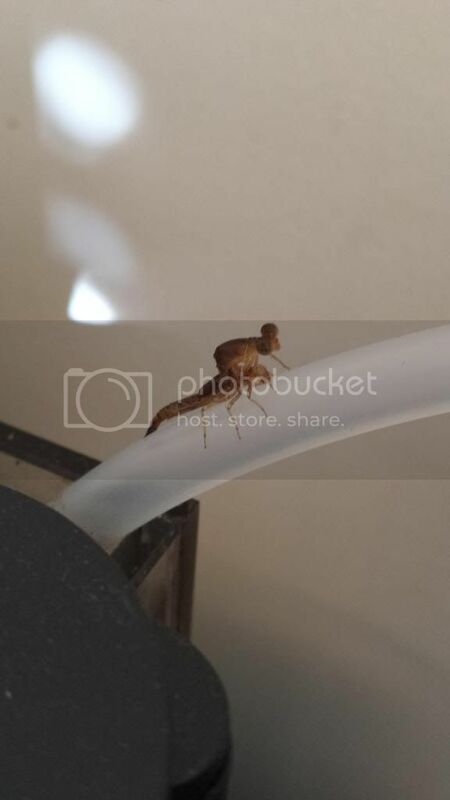 I know we have very clear pics of dragonfly nymphs - so I'd like to keep those seperate, which is why I started this as a seperate article. I did consider adding all nymphs & naiads in the one article, but figured if we could differentiate them it would be useful, as we know that the adults have different laying habits, and that the nymphs (from my small amount of reading on the forum and the net) of the dragonfly can not only remain in the tank longer than dragonflies (as they keep hatching from dormant eggs and can remain in the nymph state until conditions are right) they are also more aggressive and can take larger prey than dragonfly nymphs - including small fish. Given the size of the mayfly naiads from the photos - and there was one with wings there - they seem to be in a different league. No reason why we couldn't just have one very long article though, if people prefer, or differentiate it out later if we get the information. Thanks for the explanation, I was just a bit confused as it seemed more of a thread than an article. Btw I have really, really enjoyed the regular articles that have been submitted, keep up the good work! 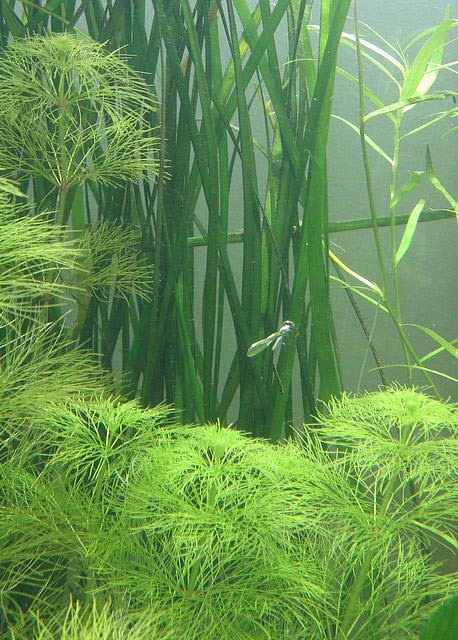 This damselfly adult flew in the window, landed on the tips of the Vallisneria nana in my open topped tank and proceeded to walk backwards down the blades of the val to lay eggs a good 30cm under water. The body and wing cuticle repells water so it traps a thin skin of air around it making it look silver. It happily marched around for a good 10-15 mins while I took photos and poked it with a stick to interrupt the egg laying. Its a neat strategy... as in the wild it allows for the pools to dry up a bit and the eggs will remain underwater. All times are GMT +8. The time now is 07:21 AM.